Gourock lies on the south shore of the Firth of Clyde some three miles west of Greenock. It wraps around Kempock Point, which projects into the Firth between Gourock Bay and West Bay. 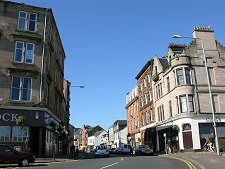 Both sides of the town climb towards the summit of Tower Hill, which commands extensive views over the Firth of Clyde to the mountains beyond. The tower that gives Tower Hill its name was erected as a viewpoint by the local laird in 1847. East of Tower Hill is the old focus of Gourock, the Gourock Burn. Alongside the burn the Earls of Douglas built Gourock Castle, of which nothing now remains. It was demolished in 1747 and used as a quarry to build the nearby Gourock House: itself since demolished. Gourock's story has always been closely tied to the story of the Firth of Clyde. In the early 1600s it existed as a linear village on the road running along the coast west from Greenock to Cloch Point, which was the embarkation point for the ferry to Dunoon. 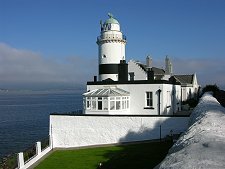 Today, Cloch Point is home to a lighthouse first lit in 1797 and lies just beyond the western end of Gourock as it spreads around the mouth of the inner Firth of Clyde. These days the ferries to Dunoon operate slightly longer crossings than they did in the 1600s, and travellers have a choice of two services. Western Ferries operate from McInroy's Point near the western end of Gourock, while Argyll Ferries operate a passenger-only service from Gourock itself to Dunoon. 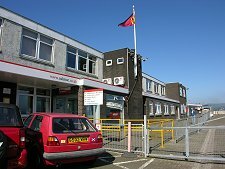 This replaced a CalMac service on the route which could also carry vehicles. 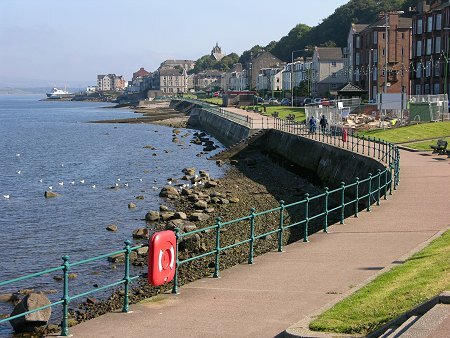 Gourock's main quay is also the terminus for the passenger-only ferry linking the town with Kilcreggan. For many years there was also a service to Helensburgh, but that ceased in 2012. This brings home the fact that the stretch of water in front of Gourock is more complex than it seems. 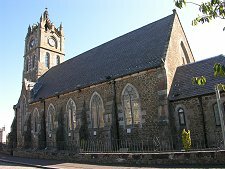 Kilcreggan, directly to the north, lies at the end of the Rosneath Peninsula, with Loch Long on one side and Gare Loch on the other. When you add in the Firth of Clyde itself, heading south east towards Glasgow and south towards Arran, plus the rather shorter Holy Loch to the north of Dunoon, it is fair to say that Gourock overlook the main crossroads of the Firth of Clyde. Much of Gourock's growth followed the arrival of the railway in 1889. The relatively late date owed much to the need to excavate Scotland's longest railway tunnel in order to complete the line from Greenock to Gourock. But once the railway had arrived it allowed the town to take advantage of the express link to Glasgow and develop as a resort in its own right. 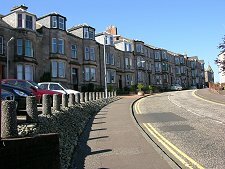 This is evident in the spread of villas around Gourock's West Bay as well as on the flanks of Tower Hill. 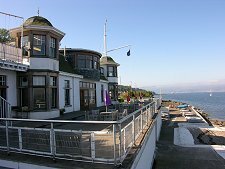 Also on West Bay is the Royal Gourock Yacht Club, while the higher ground overlooking this end of the town is home to Gourock's rather exclusive golf club. Less exclusive is Gourock's outdoor swimming pool, one of the last remaining in Scotland, which is found on the west side of Kempock Point.